The designers at Sukhoi have opted for a blend of stealth and super maneuverability, rather than going for a totally invisible aircraft. The PAK-FA patent document published by Russia’s Federal Service for Intellectual Property shows the fifth generation stealth aircraft’s design is heavily influenced by low radar visibility requirements. At the same time, the Russians are prepared to sacrifice some stealth in their quest for super maneuverability and excellent flight characteristics. The aim of the invention, say the patent papers, is to provide an aircraft having low radar visibility, super maneuverability at high angles of attack (close to an astounding 90 degrees), and simultaneously preserving high aerodynamic efficiency at subsonic speeds. The papers claim that the intention of the designers is to reduce the radar cross-section (RCS) of the aircraft to an “average figure of 0.1-1 square metre”. At this range the aircraft appears like a bird on enemy radar and becomes difficult – though not impossible – to spot. The Sukhoi compares well with the American F-22 stealth fighter which aviation experts believe has an RCS of 0.1 square metre. (The actual figure is classified) Fourth generation fighters such as the Sukhoi-27/30 and F-15E have an RCS in the range of 10-15 square metres. Reducing the radar visibility of the aircraft is achieved through a combination of design and technology, in particular by shaping the contours of the airframe. According to Piotr Butowski of Jane’s International Defence Review, “Some openings and slots on the airframe’s surface – such as the boundary-layer bleeds on the sides of the air intakes and the openings on the upper fuselage immediately aft of the cockpit – are covered with a thick grid, featuring a mesh of less than one quarter of the wavelength of a search radar, which reduces the reflections from these uneven surfaces. Gaps between the airframe elements are filled with conducting sealants, while the glazing of the cockpit canopy is metallised. The PAK-FA’s two engines are placed apart in isolated pods, creating space for a large cargo compartment in between. The air intakes are located further apart in respect to the vertical and horizontal planes than the engines, creating a curvature that hides the compressor and reduces the radar signature of the aircraft from the front. The engines are also placed at an acute angle relative to the vertical plane, allowing thrust vectoring – an area in which Sukhoi excels – in the longitudinal, transverse and travel channels. The engine nozzles point outwards, which transfers a significant portion of the control of the aircraft to them even at low altitudes. This considerably improves flight safety. The movable airfoil above and in front of the engine air inlets is a unique feature of the PAK-FA, and is typical of Russian ingenuity in airframe design. The airfoils can rotate downwards around their rear edge. Similar to wing slats, they assist control when the aircraft is at high angles of attack. The air intakes are located on each side of the fuselage and they are bevelled in two planes in order to maintain flow even at high angles of attack. The inability to control roll and yaw channels when flying at low speeds because the engines are located close to each other. The curved shape of the air intake duct requires an increase in their length, and therefore, the mass of the airplane. The inability to ensure the “vanishing” of the aircraft during supercritical angles of attack. The use of fixed keels with rudders requires increasing the required area of the vertical stabiliser to provide directional stability at supersonic flight conditions, which leads to an increase in weight tail, and hence, the aircraft in general, and to an increase in drag. Comparing the PAK-FA with the F-22 Raptor or F-35 Lightning II is a difficult task because most of the specs of these cutting edge aircraft are highly classified. 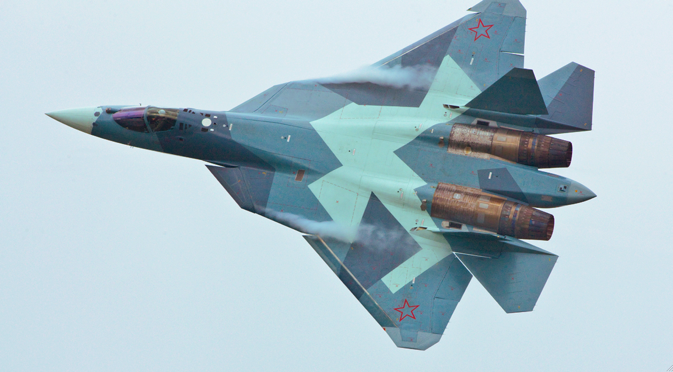 Still, going by available data, the Russian aircraft doesn’t look as stealthy as the $420 million F-22. The F-22’s stealth advantage doesn’t seem to worry the Russians. For, the PAK-FA embraces an entirely different combat philosophy where super maneuverability is considered a vital weapon. In contrast, the Americans have thrown all their eggs into the stealth basket, relying on near invisibility to strike at targets. The idea is to have “first look/first shot/first kill” air dominance capability. The aim – in reality hope – is to see the enemy first while avoiding detection. However, hope is a poor substitute for preparation. The Russian view is that it never hurts to have dogfighting abilities. At some point stealth aircraft will have to close in for the kill and that’s when a knife fight is inevitable. That’s also when super maneuverability comes into play. Slow, ponderous and poorly armed stealth aircraft such as the F-35 are likely to be clubbed to death in a fight with the PAK-FA. Plus, new radars are on their way which can detect stealth aircraft. At any rate stealth is not really an invisibility cloak as the American manufacturers and war planners are pitching it. The 1999 downing of the American F-117 stealth fighter by a highly motivated and well-trained Serbian anti-aircraft battery was a huge slap in the face of the American stealth industry. The Serbians used a 1960s vintage – yet highly advanced – Russian S-125 Neva/Pechora surface to air missile conjointly with a P18 metre band radar. They were able to bring down the F-117 within 18 seconds of detection – a stark example of the vulnerability of stealth aircraft. It will take the wars of the future to deliver the verdict on which philosophy is better – total stealth or the Russian insistence on super maneuverability. In the meantime, Russian and Indian Air Force pilots can’t wait to get their hands on what promises to be a fighter pilot’s dream. They’ll have to wait a bit longer: according to the Russian National Armament Programme, 60 PAK-FA fighters will be delivered between 2016 and 2020.